William Earnest "Ernie" Harwell (January 25, 1918 – May 4, 2010) was an American sportscaster, known for his long career calling play-by-play of Major League Baseball games. For 55 seasons, 42 of them with the Detroit Tigers, Harwell called the action on radio and/or television. In January 2009, the American Sportscasters Association ranked Harwell 16th on its list of Top 50 Sportscasters of All Time. Ernie Harwell grew up in Margaret Mitchell. An avid baseball fan from an early age, Harwell became visiting batboy for the Atlanta Crackers of the Southern Association at the age of five, and never had to buy a ticket to get into a baseball game again. At sixteen he began working as a regional correspondent for The Sporting News. Harwell attended Emory University, where he was a member of the Sigma Alpha Epsilon fraternity and helped edit The Emory Wheel. After graduating, Harwell worked as a copy editor and sportswriter for the Atlanta Constitution. In 1943, he began announcing games for the Crackers on WSB radio, after which he served four years in the United States Marine Corps. 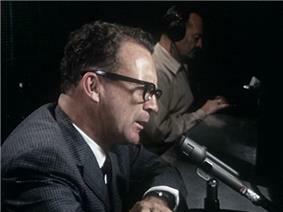 Harwell broadcast for the Dodgers through 1949, the New York Giants from 1950-53, and the Baltimore Orioles from 1954-59. Early in his career, he also broadcast The Masters golf tournament, as well as pro and college football. Ernie Harwell was honored alongside the retired numbers of the Detroit Tigers in 2000. Harwell shared TV and radio duties with Kell through 1963, then with Bob Scheffing in 1964. He began working radio exclusively in 1965, teaming with Gene Osborn for two seasons and then with Ray Lane from 1967-72. In 1973, Paul Carey replaced Lane and joined Harwell to form the Tigers' best-known and longest-lasting radio team, which lasted until the end of the 1991 season. On December 19, 1990, the Tigers and radio station WJR announced that the station wanted to go in a "new direction" and that the 1991 season would be Harwell's last, as his contract was "non-renewed". (Carey then announced that he had already planned to retire after the 1991 season, and that the decision was unrelated to Harwell's contract situation.) Fans across Michigan and throughout the baseball world were outraged, but the ballclub and the radio station (who eventually wound up blaming each other for the decision) stood firm: "[Harwell's situation is] not going to change no matter how much clamor is made over it," said team president Bo Schembechler. Rick Rizzs was hired away from the Seattle Mariners to replace Harwell in 1992, teaming with Bob Rathbun. Harwell worked a part-time schedule for the California Angels in 1992. The following year, the Tigers were purchased by Mike Ilitch, who made it one of his first priorities to bring Harwell back. In 1993 Harwell teamed with Rizzs and Rathbun on the WJR broadcasts, calling play-by-play of the middle innings in each game. From 1994-98, Harwell called television broadcasts for the Tigers on PASS Sports and later WKBD-TV. In 1999, he resumed full-time radio duties with the team, swapping roles with Frank Beckmann (who had replaced Rizzs in the radio booth following the 1994 season), teaming with analyst Jim Price, and continuing in that role even as the team's radio rights changed from WJR to WXYT in 2001. During spring training in 2002, Harwell announced that he would retire at the end of the season; his final broadcast came on September 29, 2002. Dan Dickerson, who had joined Harwell and Price in 2000, took over as the Tigers' lead radio voice. Nationally, Harwell broadcast two All-Star Games (1958, 1961) and two World Series (1963, 1968) for NBC Radio, numerous ALCS and ALDS for CBS Radio and ESPN Radio, and the CBS Radio Game of the Week from 1992 to 1997. He also called the 1984 World Series locally for the Tigers and WJR. Following his retirement, Harwell came back briefly in 2003 to call a Wednesday Night Baseball telecast on ESPN, as part of that network's "Living Legends" series of guest announcers. In 2005, Harwell guested for an inning on the Fox network's coverage of the All-Star Game (which was held in Detroit that year), as well as an inning on the ESPN Radio broadcast. For Game 3 of the 2006 American League Division Series between the Tigers and New York Yankees, he provided guest commentary on ESPN's telecast for two innings, called an inning of play-by-play on the Tigers' radio flagship WXYT, and guested for an inning on ESPN Radio. Harwell also called one inning of Game 1 of the 2006 World Series for WXYT. He also appeared as a guest on an ESPN Sunday Night Baseball telecast in Detroit on July 1, 2007. Harwell occasionally did vignettes on the history of baseball for Fox Sports Detroit's magazine program Tigers Weekly. Harwell would also begin the first spring training broadcast of each season with a reading from Song of Solomon 2:11-12 (KJV): "For lo, the winter is past, the rain is over and gone; the flowers appear on the earth; the time of the singing of birds is come, and the voice of the turtle is heard in our land." Harwell's 1955 essay "The Game for All America", originally published in The Sporting News and reprinted numerous times, is considered a classic of baseball literature. He also authored several books, and penned an occasional column for the Detroit Free Press. Harwell made a cameo appearance in the 1994 film Cobb and in the made-for-television movies Aunt Mary (1979), Tiger Town (1983), and Cooperstown (1993). His voice can be briefly heard in the films Paper Lion (1968) and One Flew Over the Cuckoo's Nest (1975) and in the TV movie The Five People You Meet in Heaven (2004). Harwell appeared as an interview subject in the 1998 documentary film The Life and Times of Hank Greenberg and contributed to numerous other baseball-themed documentaries and retrospectives over the years. The 1997 text-based computer simulation game APBA for Windows: Broadcast Blast features play-by-play commentary by Harwell. Harwell served as a spokesman for Blue Cross-Blue Shield of Michigan. His contract with the organization, which began in 2003, ran for ten years with an option for another ten. Had Harwell fulfilled the entire contract (by which time he would have been 95 years old), Blue Cross had pledged to extend it for yet another decade. Harwell formerly ran a blog about healthy living and fitness for BCBS. He retired from it on March 5, 2009. A devout Christian (he was born again at a 1961 Billy Graham crusade), Harwell was long involved with the Baseball Chapel, an evangelistic organization for professional ballplayers. In 2004, the Detroit Public Library dedicated a room to Ernie Harwell and his wife, Lulu, which will house Harwell's collection of baseball memorabilia valued at over two million dollars. On April 26, 2008 Harwell was presented with an Honorary Doctorate of Humane Letters from The University of Michigan at their Spring Commencement ceremony. One week later, on May 3, 2008, he was presented with another Honorary Degree of Laws this time from Wayne State University. In late 2008, Harwell began to appear in television public service announcements for the Michigan Association of Broadcasters, advising viewers about the Digital television transition in the United States. Harwell was a member of the Old Tiger Stadium Conservancy Board, an organization which attempted to save portions of Tiger Stadium. He offered to donate a large portion of his historic collection of baseball memorabilia, which he had collected over the course of his storied career, if part of Tiger Stadium could have been saved for a museum. Harwell lived in Farmington Hills, Michigan and moved to Novi, Michigan in the late 1990s where he lived until his death. Up until just before his death, he still exercised regularly, did sit-ups, used a treadmill, and lifted weights. The Fordham University radio station WFUV. The press box at Detroit's Comerica Park was officially named the "Ernie Harwell Media Center" following his retirement from broadcasting. The Cleveland Indians also named their visiting radio booth at Progressive Field after Harwell. The site of Tiger Stadium now has a sign on the fence as "Ernie Harwell Park", but it is now currently or officially a city park. On June 6, 2013, the Wayne State University Department of Athletics in conjunction with the Ernie Harwell Estate and the Ernie Harwell Foundation announced the establishment of the Harwell Field Project. This project is an outreach effort to build a baseball stadium in recognition of Ernie and his wife of 62 years, Lula "Lulu" Harwell. Harwell Field will provide grandstands, press box, team clubhouse and a foyer to recognize the achievements and contributions of the Harwells. On September 3, 2009, Harwell announced that he had been diagnosed with incurable bile duct cancer, and that he, his family and doctors had decided against surgery or other treatment of the condition. On September 16, Harwell gave a farewell address to fans at Comerica Park between innings of a game between the Tigers and the Kansas City Royals. Harwell sat down for a 60-minute interview on an episode of MLB Network's Studio 42 with Bob Costas, his final television appearance. The episode premiered November 17, 2009. In the interview, Costas correctly foresaw the 2009 World Series would unfortunately be Harwell's last. Harwell died on May 4, 2010, at his home in Novi, Michigan, surrounded by his wife of 68 years, Lulu, and three of their four children. He was set to receive the Vin Scully Lifetime Achievement Award in Sports Broadcasting on May 5 in New York City. Harwell considered Scully to be the best broadcaster of all-time. However, in accepting the award on Harwell's behalf, Al Kaline noted "We Tiger fans respectfully disagree." Harwell lay in repose at Comerica Park on May 6. Over 10,000 fans filed past the open casket. May 10 was declared Ernie Harwell Day at Comerica Park. 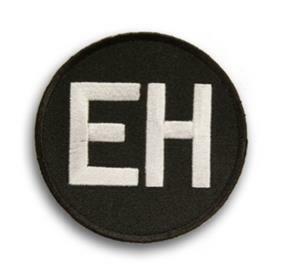 Several players and broadcasters hoisted a flag in center field bearing his initials, similar to the ones that were also sewn onto all Tigers uniforms. Harwell's longtime broadcasting partner Paul Carey threw out the ceremonial first pitch that night. ^ Lage, Larry (May 4, 2010). "WWII Marine, legendary broadcaster Harwell dies". 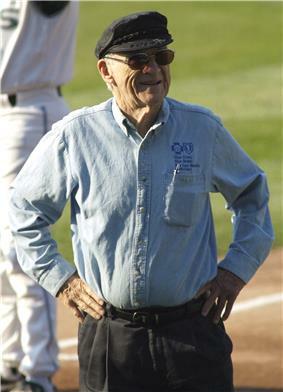 ^ "Lions Honor Legendary Tigers Broadcaster Ernie Harwell". DetroitLions.com. 2009-09-20. ^ A 1993 rendition of Harwell's Song of Solomon reading can be heard at "Listen to Ernie Harwell's 'The Voice of the Turtle,'", Detroit Free Press sports blog, posted 25 February 2009. ^ Yonke, David (April 21, 2007). "Harwell no longer shy about his faith". ^ Bill McGraw (2009-09-03). "Not even cancer diagnosis can shake Harwell's spirit". ^ ESPN.com – Harwell to receive Vin Scully Award. ^ Stephens, Bailey. "Emotional Kaline accepts award for Harwell". MLB.com. ^ Beck, Jason (May 10, 2010). "Detroit honors Harwell with stirring tribute". MLB.com. Retrieved July 8, 2010. Ernie Harwell Collection from the Detroit Public Library.